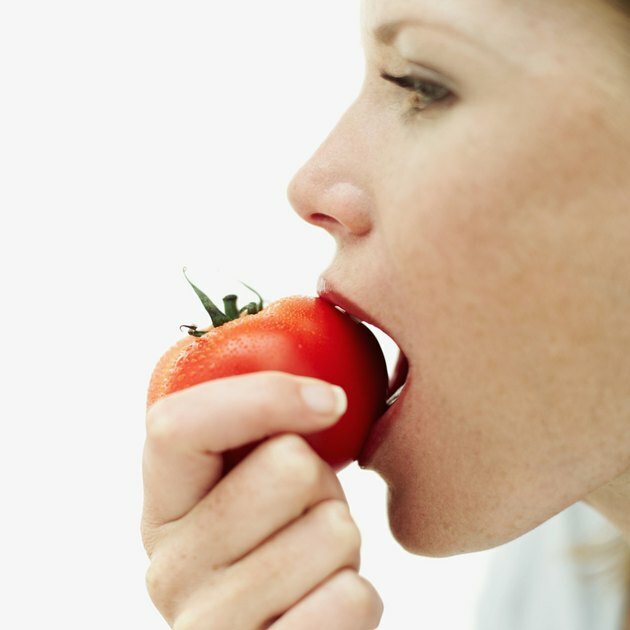 How Many Calories Does a Tomato Have? Tomatoes provide significant amounts of vitamin C, potassium, lycopene and other nutrients, in a very low-calorie package. Their calorie count depends on several variables, including color and size. If you’re getting your tomatoes mainly on cheesy pizzas or pasta dishes, though, their low-calorie content will be overwhelmed by the high calories in the other ingredients, so choose minimally processed tomatoes for the healthiest option. A medium raw red tomato, about 2 1/2 inches in diameter, weighs in at 44 calories, and cooking it without oil doesn’t change the calorie count. If you use plum or Italian tomatoes to make sauce or salsa, each supplies just 11 calories. Each cherry tomato in your salad contains 3 calories, and a slice of tomato on your sandwich or burger adds the same number to your total. Like bell peppers, tomatoes come in a rainbow of colors, each with a different calorie count. For example, a medium raw orange tomato has 18 calories, and a yellow tomato of the same size has 32 calories. If you’re partial to green tomatoes, one medium fruit adds 28 calories to your daily tally; be aware, though, that coating green tomato slices in bread crumbs and frying them in oil will substantially raise the calorie count per serving.